Low Resistance Standards - 2000 Series oil at 25 °C | Ohm-Labs, Inc. The 2000 series Low Resistance Standards are designed as primary laboratory references for maintaining the ohm at levels below one ohm. Based on recent advances in materials processing, these standards provide good long term stability. Models 2000, 2001, 2002 and 2003 (1 ohm, 0.1 ohm, 0.01 and 0.001 ohm) have a nickel-chromium alloy resistance element, carefully heat treated for low temperature coefficients of resistance (tcr). One ohm and 0.1 ohm standards are housed in oil filled cans. 10 and 1 milli-ohm standards are housed in perforated cans for oil or air circulation. Models 2004 and 2005 (100 and 10 micro-ohms) are made with Manganin alloy elements, housed in a larger perforated can for dissipation of heat. These models include an installed temperature sensor (10 K thermistor). 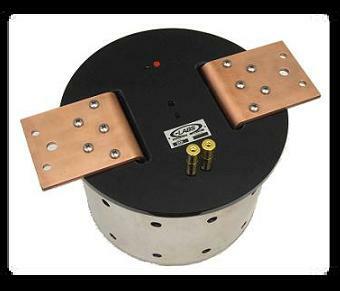 These models are designed for higher current and may also be used as primary level current shunts. All models are supplied with an ISO17025 accredited report of calibration, including temperature coefficient data at multiple test currents. The 2000 series may be used in air or in stirred oil. Special or intermediate values are available by special order. For secondary low resistance standards, please see our 1000-series resistors. For accurate current measurement, please see information on our precision current shunts. Temperature coefficients are at nominal 25 +/-5 °C.